When I attended my 50th reunion in the fall of 2015, the East High School experiment (“A School They Now Call Their Own,” November-December 2017) had just begun and there was a fascinating presentation that described the project, its goals, structure, and the amazing redefinition of the entire employment contract with the school’s administration and teaching staff. The project competed with similar efforts in Washington, D.C., New York City, and other major urban centers, where each of the others had hired a leader and seemed to provide financial and possibly other support. 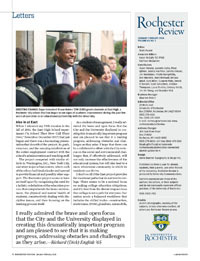 The Rochester project seems to have set itself apart by recognizing the need for a holistic redefinition of the education process that comprehends the home environment, the physical and mental health of students, constructively dealing with discipline issues, and then focusing on the learning process itself. As a student of management, I really admired the brave and open focus that the City and the University displayed in creating this dramatically important program and am pleased to see that it is making progress, addressing obstacles and challenges as they arise. 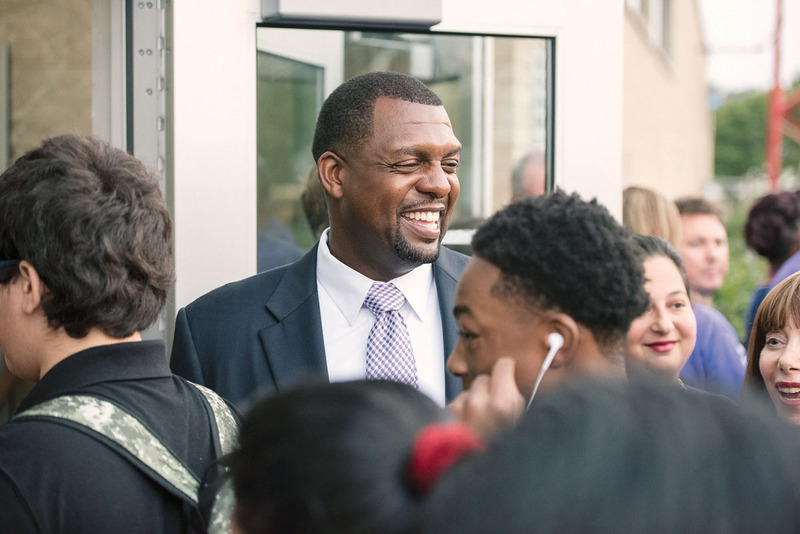 I hope that there can be a collaborative effort with the City to focus on the social and environmental challenges that, if effectively addressed, will not only increase the effectiveness of the educational system, but will also lead to a more wholesome community in which its residents can thrive. I don’t recall if the East project provides for vocational paths that do not involve college. There seems to be a national focus on making college education ubiquitous, and it’s clear from the dismal dropout rates that college is not a path for everyone. Our nation needs a balanced workforce that includes the skilled trades—construction, electricians, HVAC, plumbers, automobile, and heavy equipment assembly, maintenance, and repair people, etc. As computer technology evolves, fewer and fewer traditional workers will be needed in certain areas, but there will always be a need for many of the trades. High schools and community colleges must provide paths to these career fields and help to remove any stigma attached to noncollege career paths. I’ll look forward to hearing more about East High School. As one of the oldest East High alumni, I take great pride in my old school and appreciated the cover story in the November-December issue. An international initiative designed to connect and support professional musicians of African descent that has deep roots at Rochester has earned recognition from one of the leading philanthropies in the country. The Gateways Music Festival, in association with the Eastman School of Music (“A Musical Feast,” July-August 2017), has been awarded a $300,000 grant from the Andrew W. Mellon Foundation. 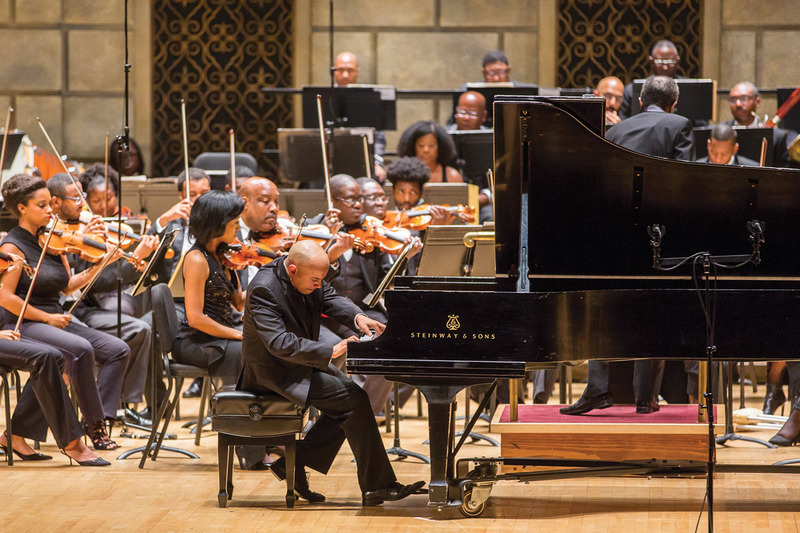 Founded in 1993 in Winston-Salem, North Carolina, by Armenta Hummings Dumisani, a Juilliard-trained pianist and retired associate professor at Eastman, the festival attracts professional classical musicians of African descent from the nation’s top orchestras, chamber music ensembles, and educational institutions. The six-day festival presents more than 50 solo, chamber, and orchestra performances in Eastman Theatre, houses of worship, schools, and other community locations throughout the Rochester area. The organization will use the grant to strengthen administrative and programmatic activities. I was inspired by the story “Forever Friends” (September-October) to share my own recent support from great UR friends. In October 2016, my wife, Marce, was diagnosed with stage III breast cancer, a terrifying and unexpected experience for our family of four. Our daughter, Katherine, is 6 and son, William, is 3, both blissfully young enough to not understand the severity of Mommy’s illness. Marce and I decided early on to keep our fight private, away from social media, and shared only with family and a close circle of friends. For me, this included my UR 2000–01 track and field captains and dear friends, Sam Albert ’01, ’02W (MS) and Jon Coyles ’01. Sam is currently UR’s director of track and field, and Jon is a vice president with Major League Baseball. I sent them both a short email and quickly received supportive replies. Unbeknownst to me, my brothers Sam and Jon took it upon themselves to alert the rest of our track and field family of Marce’s plight. Unbeknownst to them, shortly after I had reached out to Sam and Jon, I was hospitalized for five days with an infection from a previously planned back surgery. I was, admittedly, in the throes of woe-is-us despair. It was in the hospital where I received a text-picture from my wife of a delivery with a Rochester, New York, postmark. No less than 40 men and women from the 2001–02 teams responded to Sam and Jon. They all contributed to a package, including gift certificates, cleaning services and, most impactful, a touching letter. The letter offered support, memories, and kind words. It was signed by a long list of my friends, many of whom I had not seen or talked to since graduation. I was stunned. I laughed. I wept. And knew we were going to be okay. I’m thrilled to report that Marce has beaten cancer. After a year of incredible moments of love and support from friends and family locally and from away, my personal highlight was reading that letter. A gift from my UR family that I will never forget and will forever appreciate. Camaraderie is born in youth, appreciated over the years, and solidified in times of trial. I’ve lived it, and I can’t thank each of my teammates enough. Review welcomes letters and will print them as space permits. Letters may be edited for brevity and clarity. Unsigned letters cannot be used. Send letters to Rochester Review, 22 Wallis Hall, Box 270044, University of Rochester, Rochester, NY 14627-0044; rochrev@rochester.edu.